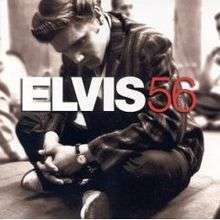 Elvis 56 is a compilation album of studio master recordings by Elvis Presley made during 1956, released by RCA Records in 1996. The original sessions took place at RCA Studios in Nashville and New York, and at Radio Recorders in Hollywood. The disc presents five singles with five B-sides, five tracks from his debut album, and six tracks from his second long-player, Elvis. All were both recorded and released in the title year of the disc, 1956, except for "Too Much," released in January 1957. An alternate and earlier take of "Heartbreak Hotel" included is previously unreleased. By concentrating on the rhythm numbers rather than the country material and the ballads, this compilation showcases Presley the early icon of rock and roll in the 1950s, also arguing for this particular year as being his most notable in the decade, and perhaps even that of his entire career.